The "openly aggressive actions" occurred as three of its vessels sailed from the Black Sea port of Odessa to Mariupol in the Sea of Azov, Kiev said. Ukraine's Yana Kapu tug suffered damage to its engine, the Ukrainian navy said. Russia said the ships were in its waters, accusing Kiev of "provocative actions". It later blocked access to the Sea of Azov with a tanker. The tanker was placed under the Russian-built bridge that spans the narrow Kerch Strait - the only access to the sea. Tensions have risen in the seas off the Crimean peninsula - annexed by Russia in 2014 - in recent months. 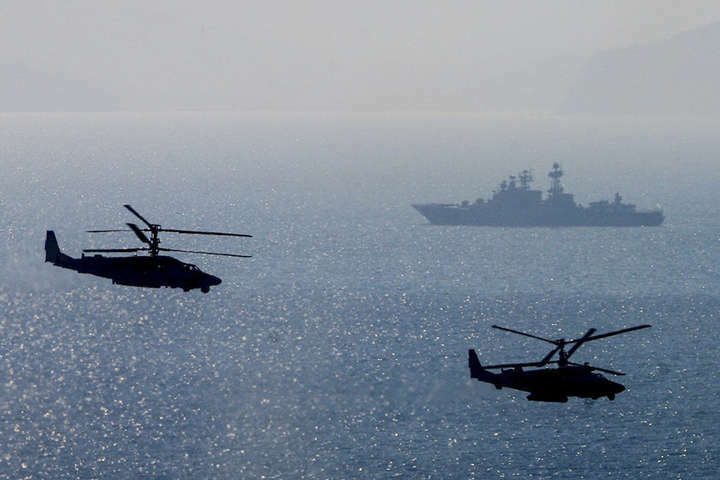 The Ukrainian navy said in a statement that its boats - two gunboats and the tug - were now being monitored by two Russian helicopters scrambled by Moscow. Two Russian fighter jets were also seen flying low over the huge arch of the bridge, which Russia constructed earlier this year. The Ukrainian navy said the boats were waiting to cross into the Sea of Azov through the Kerch Strait, which Russia had shut off. Russia said the traffic was suspended for security reasons. Meanwhile, a Russian FSB security service official was quoted by Ria Novosti news agency as saying that Ukraine had sent naval reinforcements to the area. Russia earlier said the Ukrainian vessels - two small warships named as the Berdyansk and the Nikopol, and the tug - were trying "to create a conflict situation in this region" after they left Odessa. The ships "illegally entered a temporarily closed area of Russian territorial waters", the FSB reportedly said in a statement. The navy statement said the Russian actions marked a breach of the UN Convention on the Law of the Sea. In recent weeks, a Ukrainian vessel was escorted by Russian tugs under the bridge in the Kerch Strait without an incident. In 2003, Ukraine and Russia signed a treaty on the Sea of Azov, which defined it as internal waters of the two countries. The treaty guaranteed free navigation to all Ukrainian and Russian vessels. But Russia has recently increased its military presence and begun inspecting all vessels going to or from Ukrainian ports, with some calling Moscow's actions an "economic blockade". Earlier this month, the EU warned it would take "targeted measures" to address the issue. "The situation in the Sea of Azov is damaging not only the Ukrainian economy, but also so many vessels that are flying the European Union member states' flags," EU foreign policy chief Federica Mogherini said. The Russian inspections began soon after Ukraine detained a fishing vessel from Russian-annexed Crimea in March. Moscow also says the inspections of the vessels are necessary for security reasons, pointing to a potential threat to the bridge from Ukrainian radicals. The government in Kiev has repeatedly stated that the construction of the bridge was illegal. More than 10,000 people have been killed in the eastern Donetsk and Luhansk region since separatists moved against the Ukrainian state in April 2014. Moscow denies this, but admits that Russian "volunteers" are helping the rebels.